We learned at CES this year that it simply isn't enough for affordable phones to just offer low prices anymore. And Alcatel, which is perhaps one of the most well-known budget phone makers, has chosen a compelling means to differentiate itself in this space. The new Alcatel A5 is a sub-$300 Android device that has modular components in a style that's similar to Moto's Mods. Although we don't know the official price and availability of the A5 yet, Alcatel did say the new handset falls into its pre-existing midrange Pop family of devices, which typically cost between $150 and $200. The most fun module of the three that will be available at launch is an LED case that lets you show colorful light animations on the back of the phone. You can use the onboard Light Show app to pick one of the preset options, customize your own design or set the case to light up when notifications arrive on your phone. If you choose that last setting, the LED shell will, for example, display a blue background with the letter F on it when you get a Facebook alert and a yellow background with the letter S for incoming Snapchats. We couldn't fully test this during our demo, since those apps weren't installed on our preview unit, but the custom and preset animations were certainly eye-catching (not to mention ridiculously fun). But as they're just for decoration, they're not exactly useful. 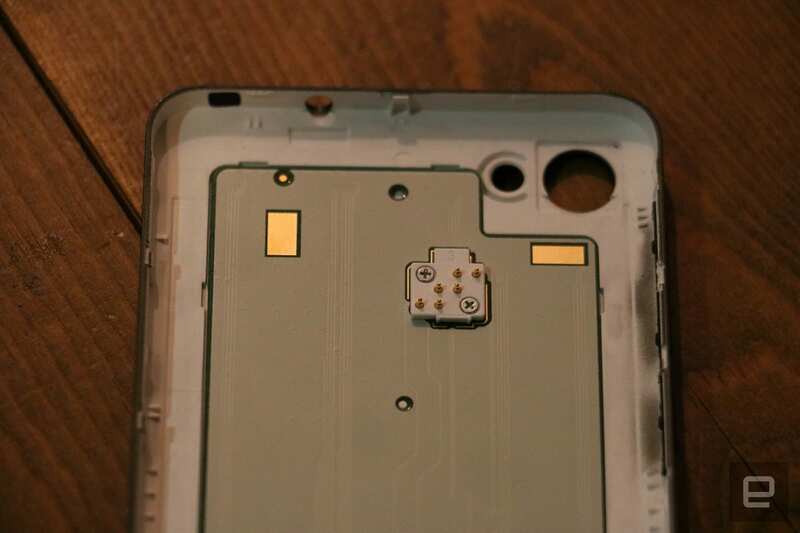 Each module is basically a case for the phone with an embedded POGO connector that you snap on to the device. On their own, the shells felt light and almost flimsy, but once I attached them onto the phone, they felt sturdy. 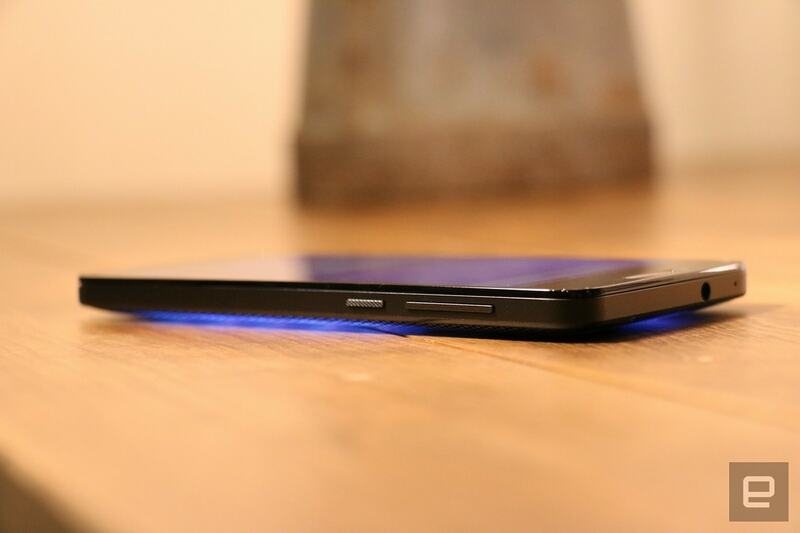 The backs were relatively easy to swap out, too, using a groove and the bottom right corner of the phone. The other two modules that we saw at our demo are an impressively slim 3,000-mAh battery add-on and a speaker case with a kickstand that boosts the volume and quality of music playback. It's not yet clear if these will be available at launch, but it's obvious Alcatel has some ideas in mind for expanding the accessory ecosystem. Another fun tool that the A5 offers is what the company calls a "color capture" camera. It's basically an updated app that will identify two main colors of whatever you point the phone at -- whether it's a vibrant painting that you like or your outfit for the day -- and generate themes for your interface based on that input. The software struggled in our demo to find colors that were relatively muted, but that's more likely because of the poor lighting at the location than a problem with the app. Once it identified the bright red of a lanyard I selected, the app created a swirly black-and-red wallpaper and changed the colors of icons for apps such as Messages, Phone and even Facebook and Instagram. Again, like the LED light case, this isn't a particularly helpful feature, but it's nice for those who frequently get bored of the way their phone looks. Other than the color capture feature and modularity, the rest of the A5's specs are pretty underwhelming, although expected for the anticipated price. It sports a MediaTek 6753 processor, a 5.2-inch 1280 x 720 display and runs Android 6.0 Marshmallow. Its 2,800-mAh battery is decent for the price range, but we don't have a runtime estimate for that yet. Alcatel says it will continue to work on modular add-ons, so hopefully we'll get to see more options in the near future. All accessories should be available for purchase online, but the packages you can buy with the phones will vary across different countries. For now, though, the device and its potential applications for those on a budget is promising.